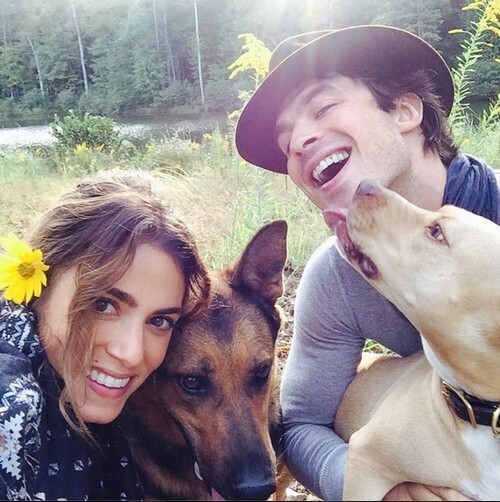 Ian Somerhalder and Nikki Reed are dating, and Ian Somerhalder and Nina Dobrev are not. But maybe someone should go tell Ian that it’s bad manners to be rubbing your relationship with your new girlfriend in your old girlfriend’s face. I mean, isn’t that what’s happening here? It’s almost as if Ian Somerhalder were using Instagram and Nikki Reed to make Nina Dobrev quit The Vampire Diaries and sign on full time to The Originals. All the headlines about ‘Ian Somerhalder and Nikki Reed dating!’ or ‘Ian Somerhalder shows PDA with Nikki Reed’ and so on and so forth, we know Nina’s hearing and seeing all of this. Even putting aside the fact that Ian is her ex-boyfriend, Nina and Ian are co-stars on The Vampire Diaries, which necessitates them seeing each other almost every day. Plus, even though the writers have scaled back the love scenes between Damon and Elena thus far in the sixth season, that doesn’t mean that ‘Delena’ can end just because Ian and Nina can’t stand each other – which means Ian is making it that much more awkward by making Nikki such a constant presence in their lives. Can’t the guy just wait until the show wraps up its sixth season and his contract ends to go gallivanting around with his new girlfriend? I get it – he wants to show off his new romance after almost two years of being ‘officially’ single, and it’s probably also revenge for all those times Nina Dobrev was caught with a new fling. But at this rate, Ian’s just going to drive Nina away to The Originals or possibly even leave the show entirely. Again, we’ve heard that the lead trio’s contracts all wrap up after the sixth season anyway, but if Nina really feels that uncomfortable, I don’t think anyone will force her to stay on the show. Editor’s Note: Ian Somerhalder is reminding me of Tom Cruise (minus the acting ability of course) in his jumping-on-couches-and-screaming-about-how-much-he-loves-Katie-Holmes days. Enough already Ian. Have a little class and emply some privacy.